Tipperary Senior Player Niall O’Meara visited Lorrha School ahead of the Semi-Final clash with Clare on Sunday April 20th. 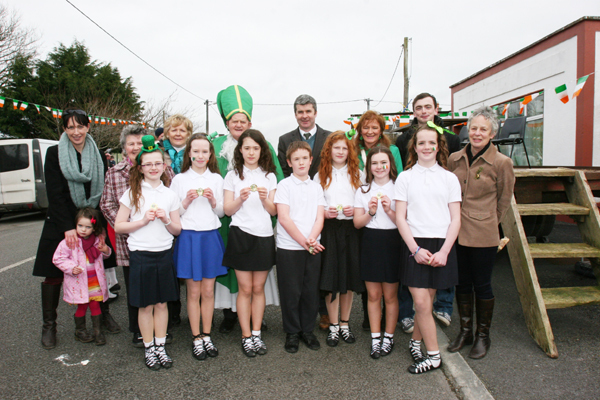 Lorrha School Dancing Pupils won 1st Prize in Lorrha St. Patrick’s Day Parade. They are pictured here with Teachers and Judges. Pupils From Lorrha N.S. 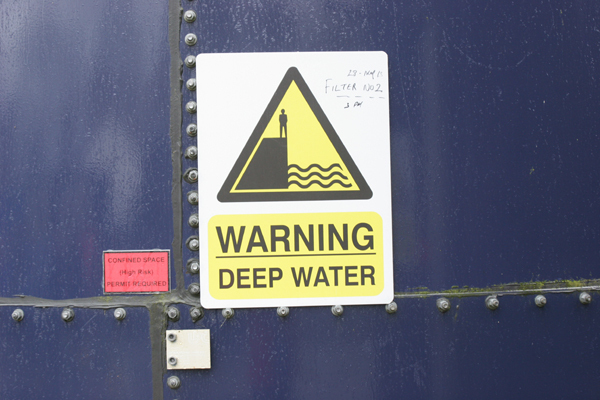 visited Portumna Water Works on March 6th 2014 as they research their 3rd green flag the theme of which is ‘Water Conservation’. Grandparents Day in Rathcabbin N.S. February 2014. 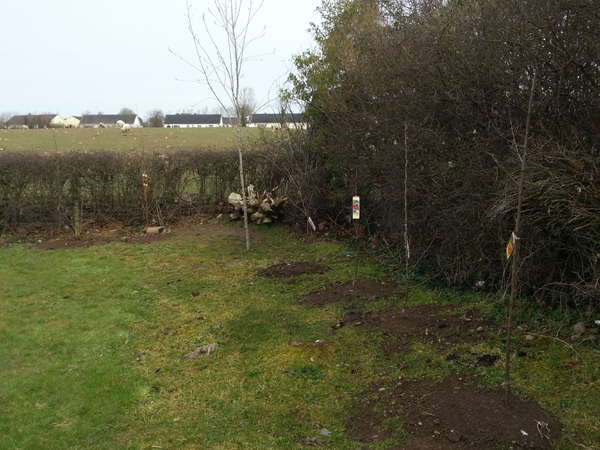 New Fruit Trees Planted in Rathcabbin N.S. at the beginning of 2014. Pancake Day with Ms. Kennedy, March 4th 2014. Winners of Rathcabbin N.S. Fundraising Table Quiz in March 2014. 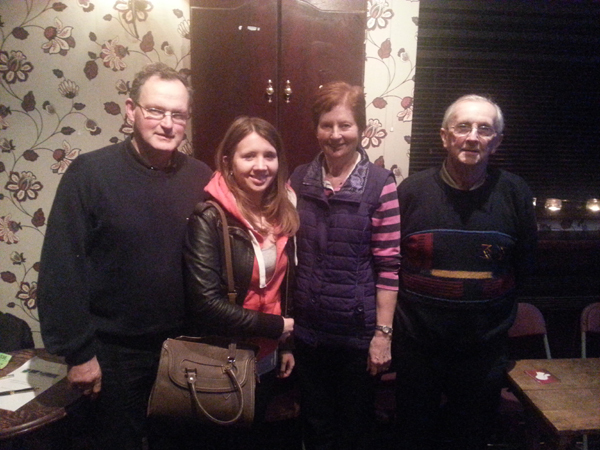 Declan O’Meara, Muireann Brophy, Helen Moran, Paddy Dermody. Quiz winners from Lorrha N.S. 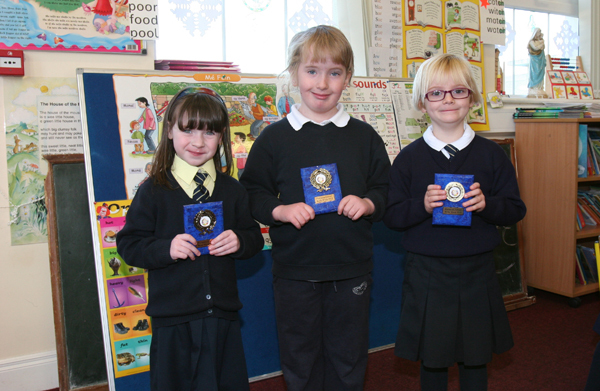 Art Winners from Lorrha N.S. Junior infants from Lorrha N.S. visit Little Gem Puppets in Portumna Library. Twins Niamh and Jack Moran, children of Deirdre and John Lorrha, were awarded 2nd and 3rd prize respectively for their writing project’s in the Portumna Shorelines Festival the theme of which was “Go with the Flow”. Michaela Young, daughter of Anna and Michael, Lorrha pictured with her winning trophies and her poem which won 1st prize for her in the poetry competition which was organized by the Portumna Shoreline Festival committee. Michaela’s entry, the title of which was based on “Go with the Flow” was a poem she composed about her little brother Nathan. She also scooped the trophy for overall student award. Well done to all three. Lochlann & Fergus water the school flowers!!! Congratulations to Lorrha N.S. Football team who brought back the Claffey Cup after winning the Portumna F.C. School blitz for the second year. Well done lads. the same evening as she celebrated her retirement at a function held in Lorrha. Lorrha National School raise their 2nd green flag on June 12th. 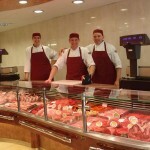 which took place in The Sheraton Hotel Athlone on Wednesday may 23rd. Redwood N.S. 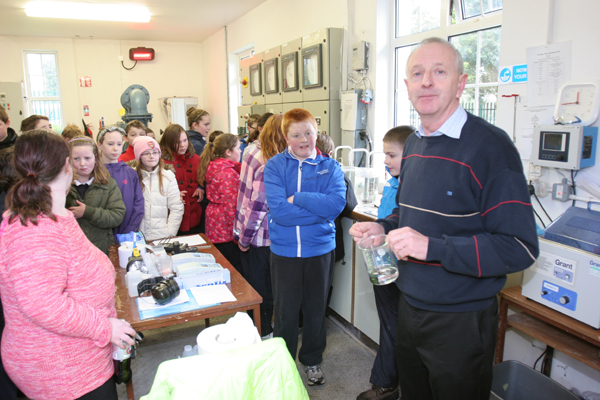 pupils visit Water Treatment Unit in Coolbawn in March. An Taisce National Spring in Scoil Lua Naofa, Lorrha. Rathcabbin National School receive a boost to their funds when chairperson of the Parents Association Mary Dermody was presented with a cheque for 2,500 euro from Rathcabbin Players Chairman Des Clancy. 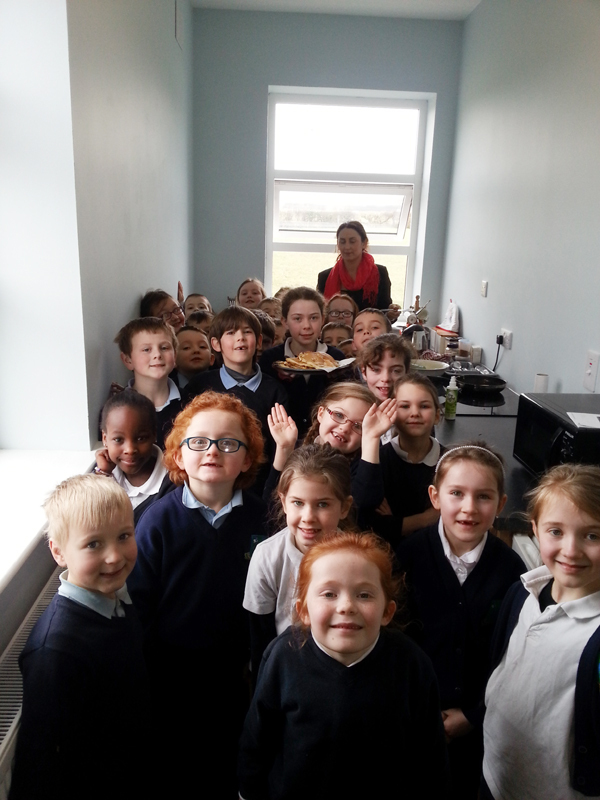 Pancake day in Lorrha N.S. hard on securing the schools second green flag which is Energy. in an effort to secure the schools second green flag, this time for energy. Lorrha N.S. 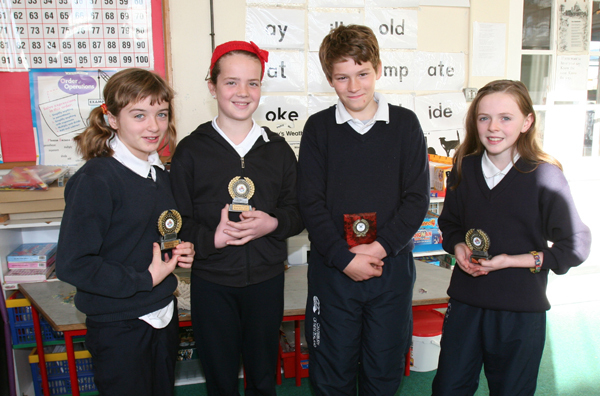 students receive football and athletic medals..
Pupils from Lorrha N.S. make a selection of St. Brigid Cross in preparation for the Saints Feast Day, February 1st. Congratulations to Lorrha N.S. 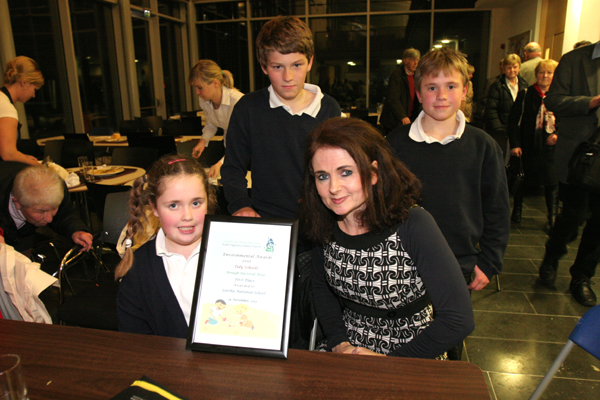 who won the Tidiest School in North Tipp at the environmental Awards held in Co. Council Offices, Nenagh recently. Mary Jane, Eoin & Julia accepted the award on behalf of the school. Team Hope Christmas Shoebox Appeal on collection day on November 10th at Scoil Lua Naofa, Lorrha. Also in the photo is school principal Olive O’Meara, Deputy Caroline O’Donoghue, Patrice Murray, Martina Duggan. Rathcabbin N.S. Raise second Green flag. Mr. Tom Kennedy retired as principal of Rathcabbin N.S. in June 2011 and pictured here with his is staff members Giolla Kennedy, Marie Brophy, Marguerite Walsh, Pauline McIntyre. Lorrha N.S. Portumna F.C. Blitz Champions 2011. Well Done All. Pupils From Redwood N.S. entertain the residents in St. Kieran’s Nursing Home, Rathcabbin. National Spring Clean in Redwood N.S. Pupils from Lorrha N.S. with their Lenten savings for Trocaire. Rathcabbin N.S. pupils and staff are working hard towards securing their second Green Flag, the theme which is “Energy”. With Energy on their minds, they went to visit a wind farm. More pictures in the Photo Gallery. Patrick ‘Bonner’ Maher visited Lorrha N.S. to promote a Easter Summer Camp in Ballinderry. Pan Cake Making on Shrove Tuesday March 8th. in Lorrha N.S. Portumna Retirement Village recently sponsored a competition for local National School students entitled ‘Appreciating the Eldery in our Community’. Scoil Lua Naofa, Lorrha featured very well and took away six awards from the competition. Clodagh McIntyre (4th. Class) was an overall winner while Certificates of Merit and a trophy was won by George Harding (6th. Class), Hannah O’Meara, Tom Duggan (2nd. Class), Caoimhe O’Meara (1st. class), Lisa Duggan (Senior Infants). Environmental Officer with North Tipp. 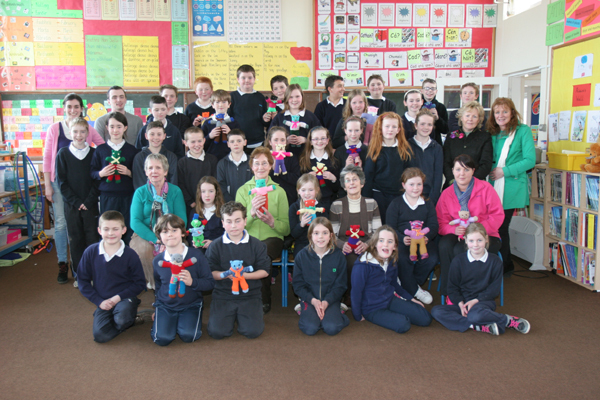 Co. Council Ms. Deirdre Cox is impressed with the pupils in Lorrha N.S. when she visit recently to view the progress in seeking their second green flag which is Energy. Application forms are now available for new entrants to Scoil Lua Naofa. Lorrha for the coming year 2011/12. The Enrolment Application Form can be obtained in person or by calling the school at (090) 9747295. Please return completed forms by March 11th. Parents/Guardians of new entrants to Scoil Lua Naofa, Lorrha are invited to our “open day” on Friday March 4th. from 1p.m. to 3p.m. Lorrha N.S. pupils perform ‘The Deck Of Cards’ during the Church Concert held on January 14th.2011. Redwood N.S. pupils performed at the Church Concert held on January 14th. in St. Ruadhan’s Church. Christmas Shoe Box Appeal in Lorrha National School. Built in 1948 Scoil Lua Naofa was the third of three schools in the parish built within a period of eight years. It replaced a two story school house in the village which was built in 1835 and had two classrooms upstairs and two downstairs with one teacher in each room. It had two open fires using the same chimney to heat the school. The toilet was a hole in the ground outside at the back of the school. The only punishment was a slap of a cane. Subjects taught were Irish, English, Maths, Geography, History & Cathecism. For luch the children brought milk and bread. The old school is used as a private house to-day. Children walked to school then and in the summer time in their bare feet. At break they played hide and go seek, hurling and ring a ring a rosy. One hundred pupils went to this school with twenty five in each classroom. The site for the new school and yard consisted of two acres of land which was aquired from the late Mr. Tom Haslam and the driving force behind this project was the late Canon Maloney who described the school as “A Little Palace”. 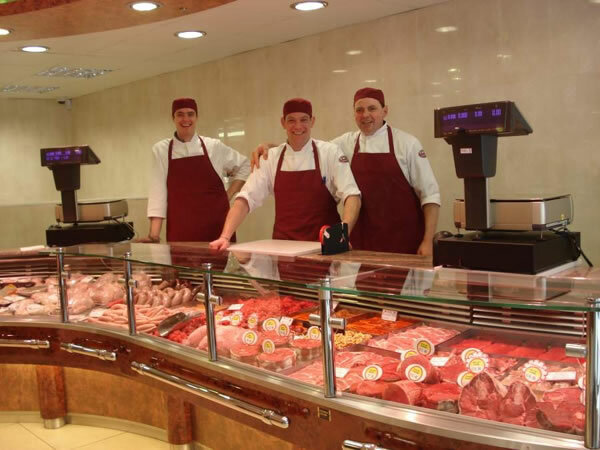 The contract was awarded to Michael Loughnane & Sons Builders Birr. The cost to build the school was £4,500. It had three teachers, Mr. Michael Cronin (Principal), Mrs. Nora Mahon and Miss Nonie Flynn. In the early sixties, Mrs. Mahon retired and she was replaced by Miss Nuala Ryan who eventually transferred to Limerick on her marriage. Miss Eileen O’Donoghue from nearby Terryglass then joined the staff straight from College. Shortly after, Principal Cronin retired and he was replaced by Mr. Pat Hynes. On Mr. Hynes retirement, Mrs. Olive O’Meara took over at the helm. In June 2008, staff and pupils bade farewell to one of it’s longest serving and much loved teacher Mrs. Eileen (O’Donoghue) Mannion who retired after Forty Years in the school, thirty nine of which was spent in the one class room. September saw the face of Eileen’s replacement when pupils and staff welcomed Ms. Patrice Murray from Portumna. Others who have taught in the school are Mrs. Nolan, Tom Kennedy and Erris Dalton. The present teaching staff are Principal Mrs. Olive O’Meara, Deputy Principal Ms. Caroline O’Donoghue, Ms. Patrice Murray, Learning Support Mrs. Pauline McIntyre, Music, Mrs. Mary Duffy, Dancing, Mrs. Phelan, Classroom Assistant, Mrs. Martina Duggan.